#LIS18 – See you at the finish line? For the past 5 months I’ve been telling you all the news regarding the Lisbon Investment Summit (or #LIS). We told you about the speakers, the investors, the reasons why you should attend… It wasn’t a fast mile, it was a marathon! Now we are 1 week away from the grand opening and now it’s time to tell you that you have 48h to get your discount on tickets for groups (buy 2 Get 3 – LIS18_CORPORATES_3BY3HURRAY) because prices are increasing, this Wednesday May 30, at 23:59.
already committed and are gearing up. 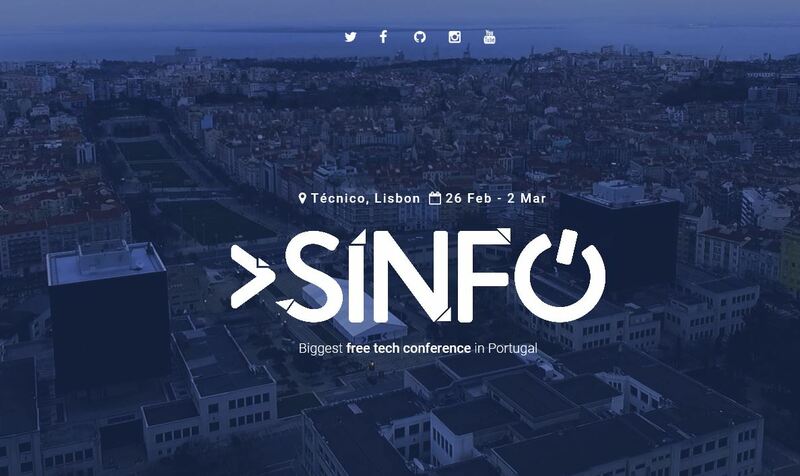 SINFO is a college student and non-profitable organization responsible for the planning of one of the biggest Tech events in Portugal. It’s an annual conference that takes place at the Alameda Campus of Técnico Lisboa, in the capital city of Portugal, Lisbon. We had a record breaking attendance of participants last year, achievement we hope to repeat next year, from February 26th to March 2nd 2018. Exponential Technology Creating the Future of Health Today. It’s all about accelerating innovation in digital health by bringing together different experts from different areas as we can see Lisbon is full of brilliant people. We have great speakers from Champalimaud & MIT, It’s supported by healthcarecity.pt and building global innovators too. Reimagining & Redesigning Health: At this launch event we will have 3 speakers reimagining/redesigning health from different discipline perspectives followed by a discussion. Aalok Y Shukla – The Ex Framework: How to design & digitise your own healthcare solution. There will be refreshments & beer kindly provided by IDEIAhub and then there will be an opportunity for a few members to present their projects or pitch collaborations they are seeking followed by networking. The purpose of this group is to share knowledge, advance thinking & collaborations in the exponential health space. Especialistas mundiais em realidade virtual e filme 360º vêm a Lisboa ser mentores de jornalistas, designers, produtores de vídeo e fotografia, programadores e artistas. A realidade da cidade aos olhos de todo o mundo… virtualmente. Durante três dias, Lisboa será palco de um evento de realidade virtual promovido pela organização Chicas Poderosas. O encontro destina-se a todos os que trabalham com imagem em contexto digital (fotografia ou vídeo), programadores, designers, jornalistas e artistas que queiram aprender sobre realidade virtual e filme em 360º, com o objetivo de desenvolver experiências de narrativas imersivas (immersive storytelling). O evento realiza-se no Museu das Comunicações e na Beta-i, em Lisboa: o primeiro dia inclui talks e conferências para demonstração e partilha de produções de realidade virtual. Os dois dias seguintes servirão para pôr as mãos na massa: realiza-se um hackathon para produção de narrativas imersivas. Em Lisboa, no papel de mentores, estarão Mariana Moura Santos, fundadora das Chicas Poderosas e ex-The Guardian, Zena Barakat, da IDEO, Antonio Camara da Ydreams, Robert Hernandez cujo trabalho pode ser visto em publicações como The New York Times, NPR ou Propublica, Barbara Lippe, a Bjork dos mundos virtuais, Linda Rath-Wiggins, co-fundadora e CEO Vragments e Millan Berzoza, da Google News Lab, Simon Duflo da Wonda VR, Thomas Seymat da Euronews, Luis Martins da IT People, Dany Rojas da 3GO e Gaby Brenes das Chicas Poderosas Costa Rica e Argentina. A maior conferência de gestão de informação e analytics em Portugal está a chegar. Pronto para ficar a par de todas as novidades? Vão trazer até à IMSHARE Conference a sua visão no que toca ao futuro da gestão de dados nas organizações em 12 painéis de debate, 4 apresentações, 2 workshops. Até o sol se pôr, aproveite o IMSHARE Lounge no jardim da Reitoria. É o momento de descontração perfeito para trocar ideias, conhecer pessoas novas e pôr todo o networking em ação. Collision Conference – looking for 10 green tech startups – any one ??? We’re looking for 10 incredible startups at the forefront of the green tech revolution, and we need your help to find them. Together with Accenture Strategy, we’re selecting 10 startups who are making a positive impact on the future of our planet. They’ll win a free exhibition stand at Collision for three days, plus access to our Mentor Hours, Investor Office Hours, Startup Workshops and $1,000 USD towards flights & accommodation. Do you know an incredible startup working on solving the environmental issues challenging our planet? Forward this email to them, or apply directly to be in with a chance to win.